In light of the swastikas spray painted on the Alpha Epsilon Pi (AEPi) and Kappa Alpha (KA) fraternities on Oct. 5, Emory’s Rabbi Donald A. Tam Institute for Jewish Studies held a “Teach-In Against Hate” on Wednesday, whose mission was to address anti-Semitism and combat racism and prejudice as a problem the whole Emory community can face together, according to an Oct. 14 University press release. 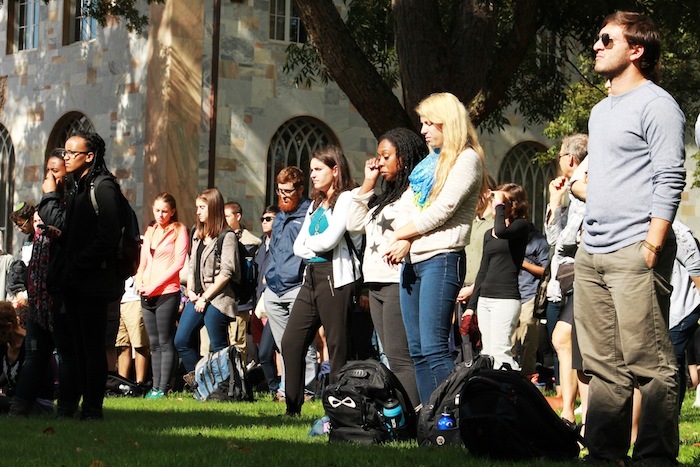 Spearheaded by Eric Goldstein, the Judith London Evans director of the TAM Institute and associate professor of History and Jewish Studies, the teach-in was “a way of honoring the values of the University and responding to intolerance in a positive manner,” Goldstein said. Goldstein said he believes that in a university setting, the most appropriate way to respond is by teaching. The event was held on the steps of the Administration Building on the Quadrangle, and the entire Emory community was invited to attend. Emory faculty from an array of departments and backgrounds brought their own ideas, including Goldstein; Deborah Lipstadt, the Dorot Chair of Modern Jewish and Holocaust Studies; Andra Gillespie, interim chair of the African American Studies Department and associate professor of Political Science and Rev. Bridgette Young Ross, dean of the Chapel and Spiritual Life. TAM partnered with the Office of Spiritual and Religious Life, the Inter-Religious Council, the Department of African American Studies, Emory Hillel, Emory Chabad and AEPi to make the event happen. Senior Vice President and Dean of Campus Life Ajay Nair and Ross echoed these sentiments in a Letter to the Editor, published on the Wheel’s website on Oct. 11. “Beyond our shared anger, let us recognize that in response to this affront, there is an opportunity for us all – as a community of students and educators – to learn, teach, reach out, advocate and heal,” Nair and Ross wrote. The speakers at the teach-in focused on condemning actions like this – no matter who is targeted – and turning them into something positive. Students were encouraged to stay away from an “oppression olympics” where different groups compete over who is most oppressed. Those who spoke said that groups who have previously been targeted should understand how it feels to face persecution; rather than dwelling on problems of the past, the incident should compel us all to extend sympathy to other groups. An attack on one group at Emory is an attack on all groups, Lipstadt stated in an Oct. 11 Emory Report.